As a solo backpacker, there are are certain areas of travel I’m not yet an expert in. Fortunately, there are plenty of experts in our community who can share their travel experiences! Lately, there’s been a growing trend among boomers taking sabbaticals, early retirements, and buying vans and just saying “Screw it! Let’s go!” when the kids move out. More and more of my emails come from boomers looking for advice – not young college kids! It’s an awesome trend. So, today I wanted to share an interview with Esther and Peter. 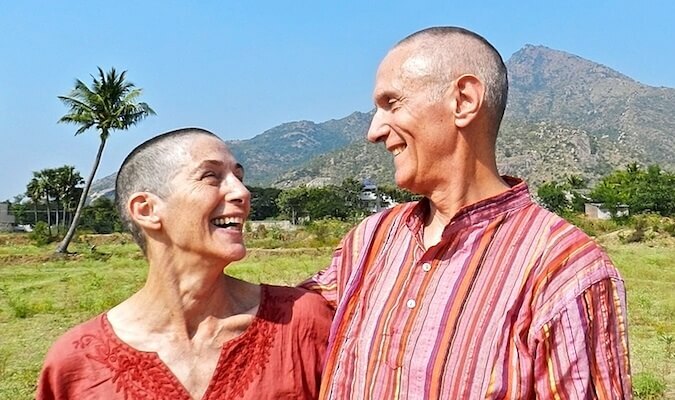 They’re are couple from Canada traveling the world on a year-long sabbatical. They share their advice on health issues, budgeting, and much more! Nomadic Matt: Hi Esther! Thanks for doing this interview. Tell us about yourself! Esther: I am an elementary school principal who has taken a self-funded leave for one year. 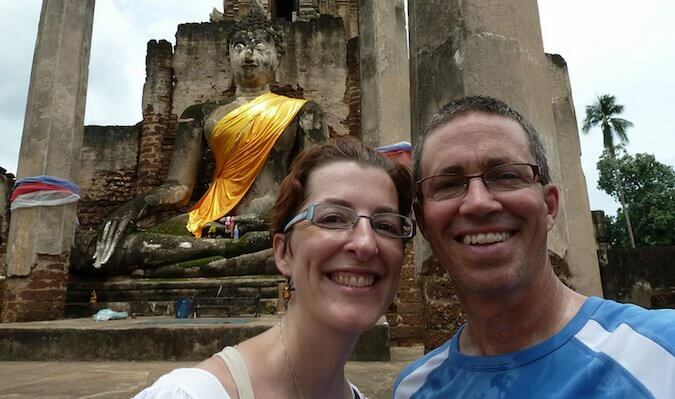 I remarried a few years ago, and my husband, Peter, is my travel partner. I celebrated my 52nd birthday at the Pyramids of Giza, and Peter celebrated his 58th at a variety show in Bangkok. We call North Delta (a suburb of Vancouver) home. How did you get into travel? I think it happened in stages. When I was still in elementary school, my parents bought me a desk that had a map of the world on the top. I used to stare at that and dream of all the incredible places there are to explore in the world. Then, when I was thirteen, my parents bought a time-share. This allowed our family to travel to Mexico and Hawaii, which were my first tropical experiences. I loved the sounds and smells and the exotic feel of it. As a university student I studied languages in both Freiburg, Germany, and Bordeaux, France. During those two years I traveled in Europe, and I think that is when the travel bug really bit me. I have yet to recover from that bite! Before this round-the-world tour, I had already traveled extensively in Europe, Mexico, Hawaii, Cuba, China, and Canada. Since August 2016, my husband and I have visited Holland, Russia, Estonia, Latvia, Lithuania, Poland, the Czech Republic, Austria, Greece, Turkey, Egypt, Sri Lanka, India, and Nepal, and we are currently in Thailand. We still have three or four months of traveling ahead of us, and the current plan is to explore Southeast Asia, but we are open to other possibilities, too. Ironically, as we travel, my list of places to visit is growing longer rather than getting shorter! What’s been the biggest lesson so far? The biggest lesson I’ve learned is that the world is simultaneously small and big. By this I mean that it is small enough to explore. It is big, however, in that there is an abundance of everything we require to sustain ourselves. If we were to put aside politics and borders and simply focus on ensuring that we distribute the riches of the world, there would, I honestly believe, be more than enough of everything for everyone. Living out of a carry-on suitcase has taught me that we actually “need” very little. What’s your number one piece of advice for new travelers? Plan, plan, and plan some more. It is not only necessary but exciting! Then be prepared to abandon your carefully made plans for unexpected opportunities that will arise. 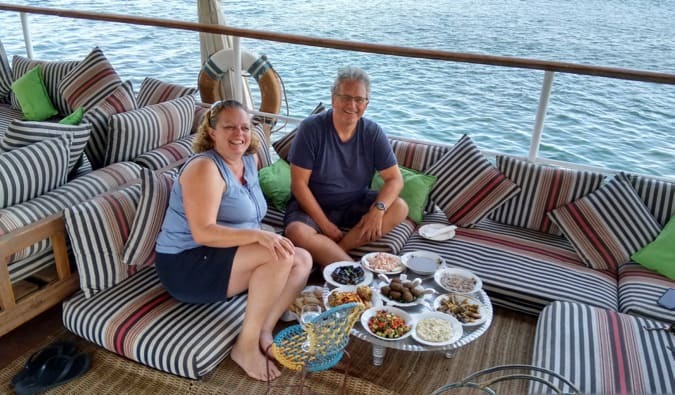 This trip we decided to forego a portion of Eastern Europe to serve as crew on a sailboat in the Dodecanese Islands, and we blew our budget to sail down the Nile on a dahabiya (passenger boat). We don’t regret those decisions one bit. A second piece of advice would be to document your journey. I am not normally one to journal, but I do while traveling, and it is tremendous to look back on even now. We also are sharing our travel adventures through blogging and social media. I am confident that the digital and hard copies will become treasured memories when the trip is over. How do you travel on a budget? We basically draw from three pots of money: my salary, Peter’s pension and savings for the trip, and the income from renting our house. We are fortunate that all three sources of income come in monthly, which makes it easy to budget. We also have savings to dip into should the need arise, but so far we haven’t had to. We look for budget accommodation. Hotels.com is where I do most of our bookings; because I write reviews of our stays, I get a percentage off subsequent stays and a free night for every ten paid nights. We have also used Airbnb on occasion. We have been fortunate to spend some time with my relatives in Austria and also with many Couchsurfing hosts. I hesitate to put either of these in the budget category though, because we don’t use these to save money but rather because it is such an enriching experience. We have been fortunate to have had wonderful hosts in the past eight months. 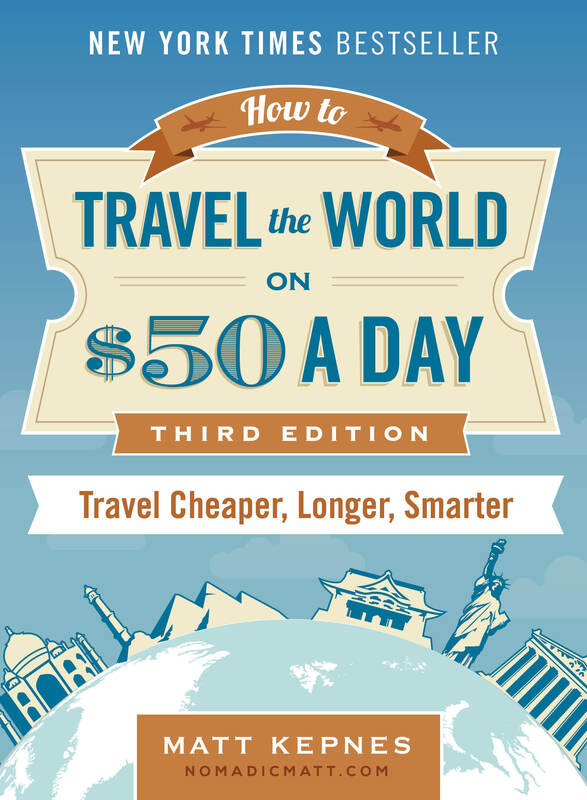 What budget tips do you have for other travelers? Track every penny you spend. While Peter tracks things electronically using an app called Andromoney, I try to keep a running total in my head. Often my total is WAY off, as it is easy to forget a taxi ride, a cup of coffee, a snack at a roadside stand. We go over our $150 [Canadian] for the two of us some days, knowing we need to make it up on others. Your husband has some health issues. How do you handle that on the road? 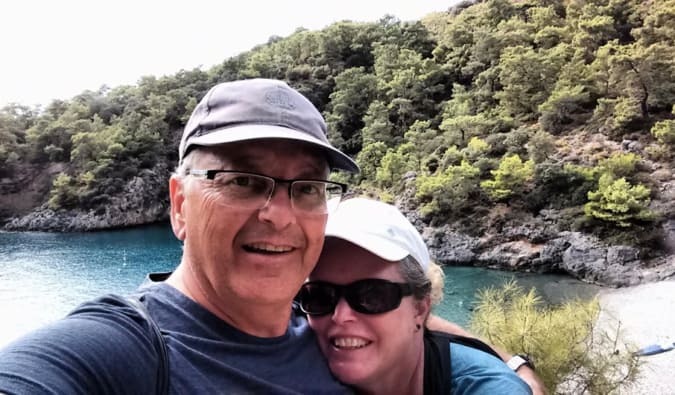 While we have been planning this round-the-world trip for a few years, our resolve became greater when Peter had a stroke two years ago. He worked hard to recover, but it was a reminder that life is uncertain and that we don’t know how many days or years any of us have ahead of us, so we should fill them doing what we love. We delayed our trip by one year while Peter worked on recovering. Originally, we planned on driving around Iceland so we could hike to the natural hot springs. Peter’s high blood pressure and hot springs aren’t a good combination, so instead we decided to sign up for a bike and barge tour in Holland. His medical condition also caused us to think carefully about which travel insurance would cover pre-existing conditions. Peter packed a year’s worth of medication and his blood pressure cuff, and he monitors his blood pressure regularly. Additionally, I have a bad hip, and the doctor has told me I will eventually require a hip replacement. We strive to live a healthy, mainly vegetarian lifestyle while traveling, but it is difficult in many countries. Between the two of us, we are mindful of our physical limitations and that some activities we might have undertaken in our twenties simply aren’t for us now. That is the reality of growing older (for us at least). We are still able to do all of the activities we enjoy…just scaled back a bit. Have you had to see any doctors on the road? Was getting a year’s worth of medicine difficult? I had a really bad cold while in Sri Lanka over Christmas so we went to the hospital. The hospital visit and medications were only $25. I also had to have a doctor make a house call to the hotel while in India due to vertigo caused by a buildup of water in the ear, and he charged $23 for the house call and medication. For both of these medical interventions we paid cash, because it wasn’t enough to send to our medical insurance. As far of the year’s worth medication, through the Canadian medical plan you can only purchase six months’ worth, so the other half was out of pocket. Apparently, we could have picked up these medications cheaply in some countries but found that out too late. I am not sure we would want to have counted on that though because we find that even trying to get baby aspirin in the right dosage can be a challenge. Do you meet a lot of travelers your age on the road? If so, how? This has been tricky. Most of the travellers our age are on group tours so they don’t tend to seek to expand their circle of friends. I make a point to start conversations with people wherever and whenever I can. Hostel and hotel lobbies are often good spots to connect with people. The most significant meetings have definitely been through Couchsurfing. When looking for a host, I don’t focus too much on the age, as our age bracket makes up a small percentage of the Couchsurfing world. Besides, I can enjoy the company of someone regardless of their age. Connecting with younger people has also been great and is quite rejuvenating. We have definitely made friendships on the road that I am confident will endure. 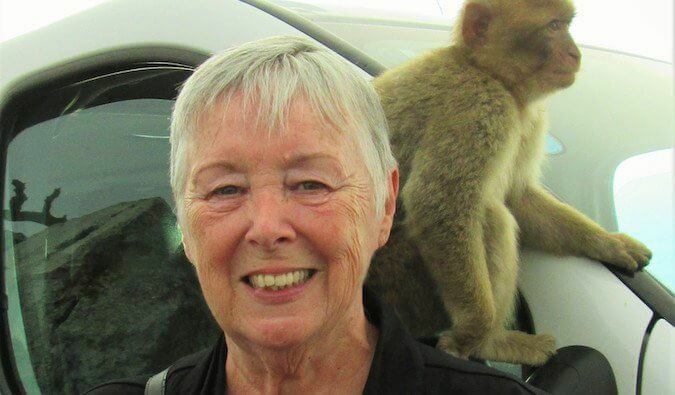 Do you find being older travelers makes it harder to find Couchsurfing hosts? A lot of older travelers worry that the site is “just for young people”. I don’t think our age has been an issue at all with Couchsurfing. If you make it clear that the Couchsurfing will be mutually satisfying, then age should not be an issue. I’d say more than 50% of the “surfers” are younger than us and we have had wonderful experiences. Actually, I think that a lot of the younger Couchsurfers take a lot without giving back by either not hosting themselves or just being a guest that sees it as a free hotel room. So being young could sometimes be viewed as a disadvantage in finding a host, in my mind. What’s one mistake you’ve made that you could have avoided? Today we were robbed by our cabbie. My husband had been to the bank earlier in the day. Usually, we split up the money between us and also stash some in some secret places so as not to have all our money in one spot. Today, we were in a hurry, hot, and tired, and we were going to do it once we got back to the hotel. It was a perfect storm. In the end, the cabbie got about 3,000,000 dong ($180 USD) by feigning outrage and then grabbing a bunch of bills from my husband’s open wallet. Not knowing what he was going to do next, we got out of his cab as soon as he hit the unlock button. He was acting quite irrational, so we were happy to remove ourselves from that situation without greater loss. It has rattled us a bit and reminded us to follow all the common-sense safety measures. What advice do you have for travelers your age? GO NOW! Many people are waiting for retirement or the economy to improve or their children or grandchildren to be older. There is always something that will hold you back. Independent traveling won’t get easier as the years pass. Some people might feel it is a selfish indulgence, but perhaps that isn’t such a bad thing. We have spent decades dedicating ourselves to working, raising children, and dreaming about “one day.” It is OK to decide that day is today—pack your bags and go! P.S. – We are hosting a Q&A with Couchsurfing on September 28th. Come join and find out how to crush it on Couchsurfing and meet locals on your travels! You guys are an inspiration to all! Showing people with limitations can also travel the world and that nothing should hold you back. We immediately sent this link to our parents to show them they have nothing to be afraid of. Love the fact that you are open to couch surfing as well and we have also found it’s a great way to meet people, even if we do not stay with them. Good luck on the road out there! I dig Esther and Peter’s views here. Especially on needing little. Being a digital nomad, I gotta be a minimalist. Not because I label myself as one, or try to be one….I have to be one, to be sane, circling the globe. Stuff would weigh me down. So I have little stuff. I have also learned that I need little to enjoy my travels. Me, aka, my meat suit, some clothes, money, Chromebook and phone for work, and some lodging, and good food. The rest is experiences, and recording these moments via video and images for my readers, to inspire them to see the world or to live vicariously through me. In any case, we need little, guys. Just some stuff, some dough, and a willingness to live awesome experiences around the globe, embracing new cultures and seeing the little-big nature of travel this awesome duo so beautifully explains. 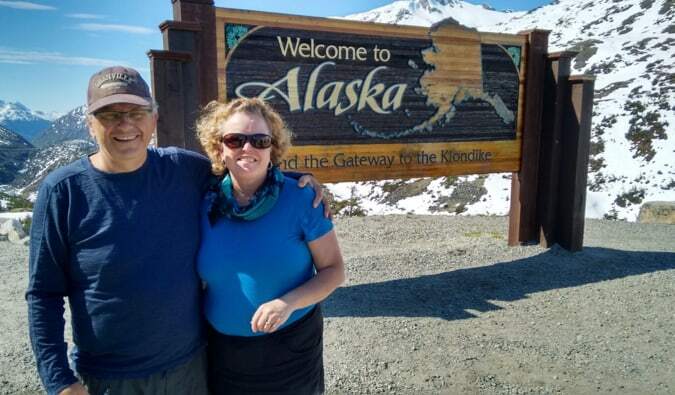 I find this couple to be inspiring and hope that I am as adventurous as they are when I get to be that age! They’re in Canada, so perhaps not an option, but this does seem like the perfect situation for the couple to explore travel insurance protection as a credit card benefit. The AMEX unlimited comes to mind – I know I would want it, although they seem to have gotten lucky so far (and I hope they continue to do so)! Actually credit card insurance is the most limited and has many exclusions. If you are a long term travelling you are better getting separate medical insurance, and in some cases paying the premiums for pre-existing conditions. Love these stories, as we are about to embark on a year long journey. Our travels will take us to the Winter Olympics, S. E. Asia, China, Siberian Train, World Cup, travelling through Europe, and ending in France for 100th anniversary of the end of WW1. I love it! I’m 40 myself and want to travel as much as I can – for now, combining it with full-time work. 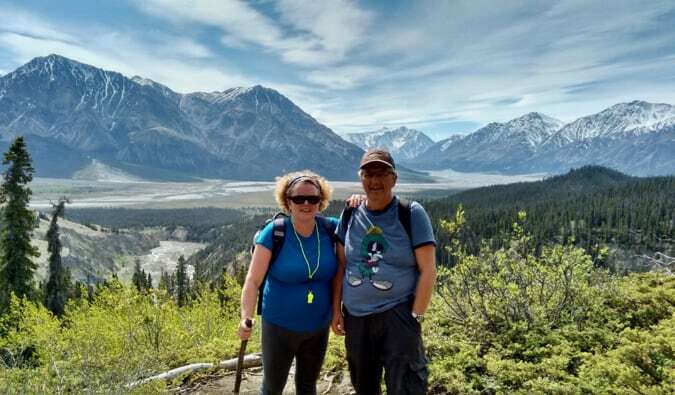 I am so happy more and more people try to fit some travels or hiking in their lives no matter their age – it’s never too late! hi love all the stories…. We are a big fan of South America…We have been to Uruguay twice, Ecuador and Buenos Aires…We are leaving on Oct 15 from Boston to fly to Chile to rent a car because it is much cheaper than Argentina. we will then drive under the Andes and our first stop will be San Rafael in Arg. We will go down South following the Andes and stay in Bariloche…Los Antiquos etc till we cut across to Rio Gallegos and then to Uashuia…we will then head north on the east side…Puerto Madryn etc…and spend a week in Salta…on the way there we have many stops..end in Mendoza to see this beautiful country…We are taking 2 months to drive approx 4000 miles…I have done all the bookings on Booking.com…I have always had good luck using them before..what I am looking for is a map of the the servce stations in Arg….Am also scrambling to increase my vocab in Spanish…any coments??? This is very inspiring, thanks! Great to hear about Couchsurfer being used and accepted by travellers of all ages, especially as you tend to often hear about its reputation as being a ‘hook-up’ kind of site for young backpackers. Definitely agree that the best time to travel is now! I should share it with my parents who prefer to travel in groups than just the two of them. Interesting perspective, especially regarding health and travel. I had a health scare myself a few years ago and it caused me to re-think life, as in that I shouldn’t take my health for granted and how it’s important to do the things I like to do now. What an inspirational couple! They prove it´s never too late to pack your bags and travel the world. I´m sure their children are proud of them – not to mention envious! When I’m retired, I want to travel and live like you, you are a model for me! We have used Workaway to live and travel across Australia and Canada where our board and lodgings have been earned by 25 hours work. Many of these activites felt much more like fun than work. We met amazing people living tough but rewarding lives and made some superb friends. We also run a ski chalet in the French Alps for the winters amongst a cohort younger than our children. We feel to have become part of the communities, not just tourists viewing from the outside. We haven’t looked back since starting this lifestyle 3 years ago. Like Esther and Peter, we have had some medical issues which have been handled with planning and preparation. We have also kept a blog to keep family and friends informed of our whereabouts and activities but also so we can read it again and relive these adventures when we become too decrepid to continue. Can’t recommend this lifestyle enough.